Interpretive Trainer and Coach Certificate Program"
While other organizations may offer certified interpretive trainer or related certificates, our Certified Professional Interpretive Trainer Certificate is far more content extensive, taught at a university level, and more in-depth than any of the other interpretive certificates. It offers more current content, hands-on learning experiences, and direct content with the Certificate Manager/Trainer and Coach throughout your Certification experience. It is based on 40 years of offering and conducting interpretive training workshops and courses world-wide. 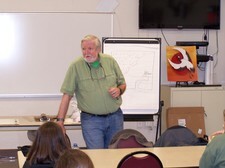 - Taught and coached by professional interpretive trainer John Veverka, with 40 years of actual interpretive training experience, as well as years of presenting hundreds of interpretive training programs and workshops. This includes developing and teaching a courses on interpretive master planning at the Ohio State University and teaching introductory and advanced courses in heritage interpretation at Michigan State University. - Based on a University Course Outline system consisting of completing five actual courses in interpretive training experiences, interpretation, not just taking one course, one test and mainly paying the course fee, our Certification Program courses are offered in content sequence leading up to the final course in developing your interpretive training course manual and general training (draft) Schedule of Instruction for a training program you plan to offer. Also developing a course pre-post test content evaluation tool. This certification can apply to a parks, museum, zoo, federal agency or other agency or organization interpretive training opportunity. It is also a course needed by any consultant offering interpretive staff training as part of their consulting services who have no professional interpretive training (B.S., M.S. or other certificate University program). - Awards CEU (Continuing Education Unit credits) for the Certificate Program (and each individual course that is offered as part of the Certificate Program. - Ph.D. program in Interpretation at Michigan State University. - New York State University. Adjunct Professor, Heritage Tourism Institute. - Certified Professional Heritage Interpreter (Canada). - Author of several interpretive planning/training college text books. - Publisher of InterpNEWS - the International Heritage Interpretation e-Magazine. - 40 years of interpretive planning, training and writing experience. 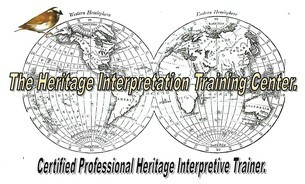 Introduction to Heritage Interpretation Course. 14 Units - 2 CEU credits. A review of interpretive basics in case you never had a college level course in interpretive principles, practices or theory. You can also use these training approaches and teaching aids in your own training courses. An introduction to planning and presenting live interpretive programs and tours for Museum/Heritage Site Docents and Volunteers. 12 Units - 1.5 CEU credits. A short course on teaching docents and other staff in conducting interpretive tours. Training for Interpretive Trainers e-LIVE Course - 11 Units and 2 CEU Credits. $200.00. Our main course on how to effectively and with fun ad hands-on-experience, teach interpretive techniques, principles and "love for presenting" to others. A supervisors guide to Critiquing and Coaching Your Interpretive Staff, Eleven Units, 1.6 CEU Credits. $175.00 The final course for interpretive trainers. How well did your training work? This unit is to help you "keep on coaching" your staff to develop their skills and presentations. Optional courses, based on your training objectives. You can pick ONE of these courses to add to you certificate program. tours for Art and Traditional Museums. Techniques for revealing the hidden stories and meanings in art and artifacts for presenting dynamic and inspirational interpretive tour experiences for your visitors. 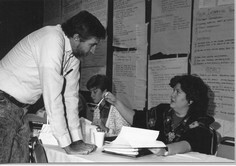 The "final exam" for the Certified Professional Interpretive Trainer certificate is for you submitting a working draft of you training course manual/workbook and/or a draft "Schedule of Instruction for a one to 3 day interpretive training course/workshop. While there is a recommended sequencing of courses, just as with any university degree program, from introductory to more advanced courses, depending on your own background and training/experience, you are allowed to undertake more than one course at a time. It is estimated that the average time needed to complete all the required courses, could be approximately 10 months. All the individual courses are "work at on your own pace" and as fast or as slow as you need to. 1. YouTube video instruction for each individual course unit. 2. Interpretive text books (e-books) and reference materials. 3. Reading assignments and materials. 4. Homework assignments to be sent directly to the course certificate manager. instructor. This is NOT an "internet-only" course. - Twenty (20) CEU unit credits. - A certificate of completion and Certification Pin. - A certification program transcript detailing the courses completed for the certificate. - A Certification Logo for you to use on your web site or other electronic media. link to your e-mail or web site (as desired). Note: unlike other certifications, you will NOT have to do everything over again in four years. This is a lifetime Certification. Note- the tuition cost includes four (4) individual interpretive courses and one optional course (based on your area of interest) and One-on-One interaction and coaching with the Certificate Manager/coach. All text books and reference materials, and individual consultation on your interpretive planning project as needed are also provided. If you would like to sign up for our Certified Professional Interpretive Trainer certificate program, you can pay the Certification tuition via PayPal or credit card. You can also contact John Veverka for more course details.